Coun Scott Dickinson, chairman of Northumberland Labour group. 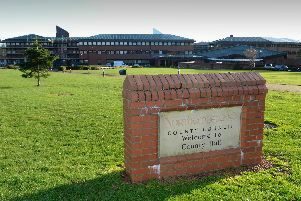 Northumberland County Council has hit back after it was claimed the ‘numbers don’t add up’ in relation to town and parishes paying more but there being fewer staff. Coun Scott Dickinson, chairman of the Labour group, highlighted information received from the authority under Freedom of Information (FOI) requests – but the council has disputed the assessment of this data and ‘rejected any suggestion that there’s been a drop in standards’. One FOI response shows that parish and town councils paid the county council nearly £18,000 more for local and neighbourhood services in 2017-18 than they did the previous year (£1,115,095 compared to £1,097,195 in 2016-17). These services include the likes of tackling dog fouling, emptying litter bins and additional grass-cutting and planting. But at the same time, Coun Dickinson suggested, there were 157 fewer people to carry out this work in the county council’s local and neighbourhood services teams, with 1,783 employees on April 1, 2017, becoming 1,626 a year later. “In what other world do you pay more for something and get less?” he said. But a Northumberland County Council spokesman said: “We have always sought to safeguard and protect front-line services from any budget cuts and refute any suggestion there’s been a drop in standards. “The council’s FOI response included details of the service areas that were included within the local services directorate staffing numbers. “It was clear from this information that the make-up of the directorate and staffing numbers within local services was not consistent during the two periods as a result of internal restructuring, rather than actual reductions to employee numbers. “The staff within neighbourhood services who provide the enhanced services to town and parish councils differs by just 10 people over this period and this was not due to staffing cuts, but simply reflects staff turnover and the use of agency or seasonal staff at that particular point in time.